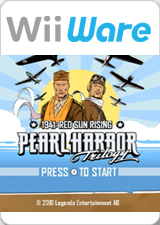 Pearl Harbor Trilogy - 1941: Red Sun Rising is the first title in a trilogy of air-combat action games for WiiWare. Take off from aircraft carrier decks and historical military bases as you conduct covert strikes, engage in furious dogfights, and fly search and destroy missions. Pilot the most prolific fighter, bomber and torpedo-bearing aircraft of the WWII Pacific Theatre! Featuring two campaigns spanning the early years of the Pacific War, you can play as either the United States Naval Air Force or the Imperial Japanese Navy Air Force. You can also choose to practice your combat skills in the Avenging Ace or Survival dogfight modes. The graph below charts the compatibility with Pearl Harbor Trilogy - 1941: Red Sun Rising since Dolphin's 2.0 release, listing revisions only where a compatibility change occurred. This page was last edited on 24 January 2018, at 02:53.